For many fans and enthusiasts, there are the original trilogy of Indiana Jones movies, all made in the eighties when director Steven Spielberg was reaching the height of his film making creativity. And then you have Indiana Jones and the Kingdom of the Crystal Skull; the poorly regarded, Johnny-come-lately fourth instalment made nearly twenty years later, that jumped the shark, or in this instance “nuked the fridge” and for some viewers, pretty much pissed on the memory of its three predecessors. Make no mistake, over a decade on from the films theatrical release there is still a lot of ill will held towards the fourth Indiana Jones adventure. Let us not forget that South Park based an entire episode around the contempt they have for the movie. Yet despite all this hostility, it should be noted that Indiana Jones and the Kingdom of the Crystal Skull was the most commercially successful entry in the franchise, grossing $786,636,033 worldwide. It was the second most successful movie in 2008 (the first being Christopher Nolan’s The Dark Knight) and although not universally well received by fans, it did broadly garner critical success. However, within that spectrum of reviews there were some strong negative opinions. 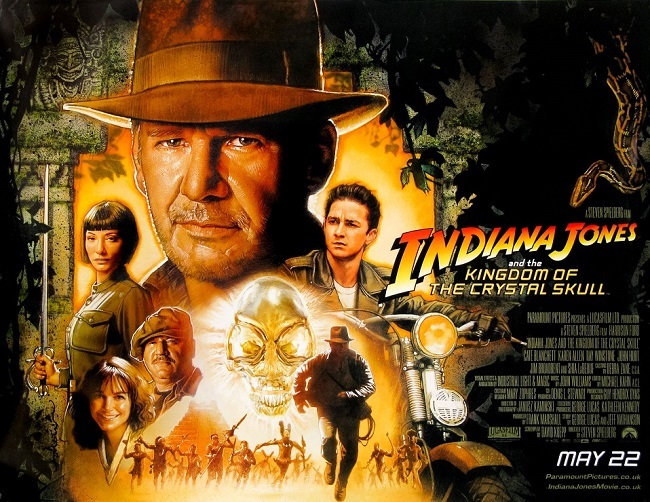 All things considered Indiana Jones and the Kingdom of the Crystal Skull is somewhat of an enigma, in so far as being financially successful but a movie that most people don’t admit to liking.